On Easter Sunday Colombia’s former president, Álvaro Uribe, wrote a blistering attack on Colombia’s peace accords with the FARC (Revolutionary Armed Forces of Colombia) guerrillas. 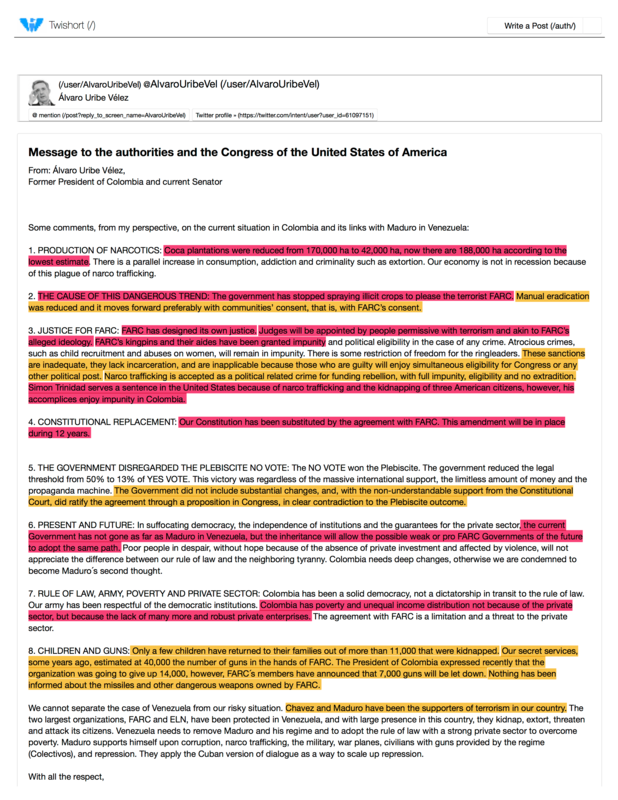 He sent it in English as a “message to the authorities and the Congress of the United States of America.” It went to every U.S. congressional office, as well as to Washington’s community of analysts, advocates and donors who work on Colombia. Uribe, now Colombia’s most prominent opposition senator, is the most vocal critic of the peace process led by his successor, President Juan Manuel Santos. The ex-president’s missive leaves out the very encouraging fact that 7,000 members of the FARC, a leftist guerrilla group, are currently concentrated in 26 small zones around the country, where they are gradually turning all of their weapons over to a UN mission. One of the organizations most involved in the illicit drug business has agreed to stop using violent tactics for political purposes and to get out of the drug economy. The process currently underway is ending a bloody conflict that raged for 52 years, and holds at least the promise of making vast areas of Colombia better governed, and less favorable to illicit drug production. Colombia’s peace accord implementation is going slowly, and faces daunting problems. There is a responsible, fact-based critique that a conservative analyst could make. Uribe’s document is not that critique. It suffers from numerous factual inaccuracies and statements that are easily rebutted. Its fixation on the FARC, a waning force, deliberately lacks important facts regarding other parties to the conflict and it does little to explain how the United States can help Colombia address post-conflict challenges. Here is WOLA’s evaluation of several of the points made by Álvaro Uribe in this document, and evaluations of their accuracy. The vast majority of his claims are either inaccurate, or debatable. Inaccurate. Two sources estimate Colombian coca-growing: the U.S. government and the UN Office on Drugs and Crime (working with the Colombian government). Their highest, lowest, and most current estimates of Colombian coca-cultivation are as follows. No estimate shows a drop from 170,000 to 42,000 hectares. Both show the lowest estimate in 2012, two years after Uribe left office. 188,000 hectares is not the “lowest” current estimate, it is the higher of the two. Using the 188,000 hectare (U.S.) figure yields an increase from a baseline of 78,000, not 42,000. Nobody denies that Colombia’s post-2012 coca boom is a problem, but Uribe’s statement exaggerates its severity still further. Inaccurate. First, the October 2015 suspension of “spraying illicit crops” with herbicides from aircraft is one of seven causes for the boom in coca cultivation, which WOLA explained in a March 13 report. (The other six are a decline in manual eradication, a failure to replace eradication with state presence and services, a drop in gold prices, a stronger dollar, a promise that people who planted coca would get aid under the FARC peace accords, and an increase in organized coca-grower resistance.) Giving all explanatory weight to the suspension of herbicide fumigation is misleading, as even the State Department recognized that the program’s effectiveness was “significantly reduced” by “counter-eradication tactics” like swift replanting and pruning sprayed plants. Debatable. The equation of rural “communities” with “the FARC” exaggerates the FARC’s power—many if not most of these communities’ members are not FARC supporters (PDF). By implicitly tying them to what until recently was a violent, radical group, this formulation also marginalizes and endangers these communities’ residents. Inaccurate. If the FARC were allowed to design its own justice, its members who violated human rights would be amnestied, and their denials of their crimes’ severity would go unchallenged. Also the transitional justice system established by the accords, the “Special Jurisdiction for Peace,” would include the full participation of international judges. Instead, FARC members accused of war crimes must provide full confessions, a full accounting of their assets, and carry out reparations to victims. An independent tribunal will issue sentences of up to eight years of “restricted liberty,” to be served in spaces the size of a small village or hamlet. If FARC members do not abide by the conditions stated in the accord, then they will be subject to ordinary justice that includes longer sentences in regular prisons. The judges will be Colombian. The negotiations between the two parties on the issue of justice were greatly influenced by international jurists, the International Criminal Court, and the current state of practice within international law. Most importantly, the agreed-upon justice system prioritizes the recommendations that truth, justice and reparations prevail over jail time made by the over 60 victims who traveled to Havana to demand that the process respect their rights. This is not “prison,” as Uribe points out, and the austerity of conditions in the restricted-liberty zones remains to be determined by the sentencing judges in each case. But it is far from impunity, and far from what the FARC would “design” for its members. Given the sheer number of cases of abuses that took place during five decades of conflict, this special jurisdiction for peace will ensure that emblematic cases are tried. This greatly contrasts with the current justice system, which is unable to produce quick and effective sanctions. Inaccurate. The judges are being selected by a committee made up of a representative of the UN Secretary General, the European Court of Human Rights, the Criminal Chamber of Colombia’s Supreme Court, the non-governmental International Center for Transitional Justice (ICTJ), and the Permanent Commission of the Colombian State University System. (The list of appointing bodies, agreed in August 2016, also included the Vatican, which declined to participate.) None of these institutions, or their representatives, can seriously be considered “permissive with terrorism” or sharing the FARC’s political views. Not only is this statement inaccurate, it stigmatizes judges in a manner that can undermine their security. Debatable. These sanctions are only modestly less “inadequate” than the 5-8 years in prison given to pro-government paramilitary leaders under a process developed under Uribe’s presidency. (The paramilitaries didn’t kidnap, recruit children, or lay landmines as often as the FARC did, but during their years of greatest activity they killed and displaced far more civilians.) It remains to be seen how austere conditions will be in the village-sized zones where FARC members will serve sentences for war crimes. It also remains to be seen whether sentencing judges will even allow FARC members to hold political office in locations outside their zones of confinement. Debatable. Narcotrafficking will be amnestied if it can be shown that the demobilizing guerrilla channeled all profits into the FARC’s war effort and did not profit personally. Demobilizing paramilitary group members were held to the same standard during Uribe’s presidency. Each demobilizing guerrilla must declare his or her assets, and if found to be lying, will be kicked out of the transitional justice system and face regular, criminal justice instead. Inaccurate. FARC leader Simón Trinidad, who was captured in 2004, is in a U.S. prison for his indirect role in kidnapping three U.S. citizen defense contractors. He was not found guilty of narcotrafficking. FARC members who participated in kidnapping will not be amnestied, they will serve sentences in the transitional justice system. Inaccurate. The peace accord does not substitute for anything, as nothing in it suppresses or substitutes anything in Colombia’s constitution. For 12 years, the accord has a legal standing that prevents Colombia’s Congress from passing laws that might violate or undermine its commitments. That is a sound mechanism, and it’s hard to imagine any peace accord going forward without a similar protection, even if it may resemble a temporary constitutional amendment. True with a caveat. Uribe’s U.S. audience should be aware that the “NO” victory was not overwhelming: the margin was 50.2 to 49.8 percent. More troubling was the remarkably low level of voter participation: 63 percent of eligible Colombians failed to vote on October 2, 2016. The majority of Colombians in regions currently impacted by the conflict voted in favor of the accord. Indigenous and Afro-Colombian communities, who are disproportionate victims of displacement, violence and conflict, resoundingly voted in favor of peace. Debatable. After the original August 2016 accord was defeated by the October 2 plebiscite, Colombia’s government heard proposals from leading opponents, which it took to the FARC for several weeks of re-negotiation. The resulting November 2016 accord included over 500 changes. Substantial adjustments included severely restricting the size of zones to which FARC war criminals would be confined, requiring FARC members to declare all of their assets and provide “exhaustive and detailed” information about links to the drug trade, and requiring case-by-case consideration instead of blanket amnesty for drug trafficking. One change that Uribe and other accord opponents did not get was a revocation of the 10 automatic seats in Congress (5 in the 166-person House and 5 in the 102-person Senate) that FARC members will occupy between 2018 and 2026. Uribe’s complaint that the government, the Constitutional Court, and the Congress overruled the Plebiscite outcome is, in fact, a recognition that three branches of government unanimously approved an accord that was significantly amended after losing the October 2 vote by a hair-thin margin. Inaccurate. The government of Juan Manuel Santos, which will be in office for one more year, has weakened neither free speech nor judicial independence: in fact, the Constitutional Court already struck down one of its first decrees for implementing the peace accords. It is not clear why Uribe thinks that Colombians might suddenly opt for a pro-FARC, pro-Venezuela political path. The latest bi-monthly Gallup poll (February, PDF) gave the FARC a 19 percent approval rating and 2 percent for Nicolás Maduro’s government in Venezuela. (It also showed Uribe’s own rating at 49 percent with +3-point net favorability, down from consistent measures over +40 during his presidency.) This statement is completely unfounded. Inaccurate. It is frankly odd to assert that Colombia’s poverty and inequality have a single cause. It is further bizarre not to include corruption and a weak rule of law among the causes. Meanwhile, the World Bank places Colombia in 53rd place, out of 190, among the world’s most business-friendly countries: not a stellar ranking, but not low enough to be the single explanation for poverty and one of the world’s worst rates of inequality (PDF). If anything, peace in conflictive regions would do much to improve security and opportunities for international investment in Colombia. Debatable/Inaccurate. The statistic refers to all FARC recruitment of minors between 1975 and 2014. Obviously, the overwhelming majority of these children have long since grown up. Many deserted, were captured, or were killed by government forces. Some became guerrilla leaders. As of January, according to Colombia’s Defense Ministry, there were about 170 child combatants still in the ranks of demobilizing FARC; though turnovers to the Red Cross have begun, the process has been too slow. Debatable. There is no way to verify a statistic that comes from “our secret services,” but since the FARC are demobilizing about 7,000 fighters, a statistic of more than five guns per combatant seems laughably high. Uribe’s statement doesn’t refer to FARC “militia” members: part-time, non-uniformed guerrilla supporters who operate mainly in urban areas. About 6,000 militia members—nobody knows the true amount—are expected to report to disarmament sites, where they are required to spend a few days registering and handing over whatever weapons they possess. This may increase the final weapons count beyond the 7,000 of which the UN mission is currently aware. Debatable. If the FARC have, or had, missiles, they did not use them during the conflict. The only evidence we’ve seen is in a 2012 video of a single unsuccessful use of a SAM-7 shoulder-fired missile. Debatable. The Venezuelan government has done very little about the freedom with which Colombian guerrilla groups operate on the Venezuelan side of the common border. However, Colombian organized crime and paramilitary groups have also operated with great freedom in these poorly governed territories. Captured guerrilla communications indicate that FARC leaders discussed financial support with Venezuelan President Hugo Chávez, especially during a 2007 period when Uribe authorized Chávez to serve as a go-between in a failed effort to free guerrilla hostages. We don’t know whether any financial support was actually delivered. In their contacts with guerrillas, Venezuelan leaders encouraged them to negotiate peace and to win power, as they did, through non-violent electoral politics. Venezuelan diplomatic and logistical support, too, contributed importantly to the success of Colombia’s peace talks with the FARC. If Venezuela was trying to promote “terrorism” in Colombia, why did it so robustly support peace negotiations?